Dave Lawson is March’s Member of the Month. The team nominated him purely for his absolute dedication. He totally represents the phrase we used as our image for this blog. This guy comes in and smashes his workout regardless of his injuries (there have been many!) or the time of day he comes in. He supported us with our EPIC tyre flip last year and proudly wears the t-shirt around the gym. Dave is always smiling, always tidies up after himself and is simply a jolly nice chap! D – Around 7 years. What Were Your Goals When You Joined and Have They Changed? D – I’ve always had the same goals however, they can change throughout the year depending on what I’ve got coming up. For example if I am going on holiday I will do a lot of interval/ HIT training to trim up (more shape than size). However, if I am training for something along the lines of the Tough Mudder, I will do more long distance running with some added circuit training. Over the last year with my shoulder injuries, I have done a lot of muscle rebuilding exercises targeting all the little muscles in the rotator cuff/ around the shoulder blade to get my shoulder back fit. So my goals change throughout the year. 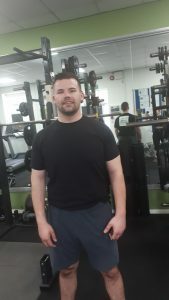 D – Always a very welcoming and friendly place with the Motive8 staff and gym members. The times I attend the gym, I can always get on the equipment I want to use. D – Looking and feeling good! I seem to have less aches and pains when I’m working out than if I am not doing anything, letting my body stiffen up. And it always helps to keep motivated if I have a goal to reach which I always do.